Building a Culture of Mindfulness is Simpler Than You Think. The shades were pulled down. The music started. A calm, slow voice invited people to relax in their seats and close their eyes for Morning Centering. Nope. This is the scene at the GE Leadership Center in New York, in a training class where 50 leaders are guided through quieting their mind and stilling their body for a few minutes, twice every day. The research on mindfulness strongly supports that meditation sharpens skills like attention, memory, and emotional intelligence. Johann Berlin, CEO of the TLEX Institute, specializes in bringing mindfulness training to CEOs and corporate teams. He’s seeing a growing interest among leaders in meditation as a way to build leadership skills – and achieve business goals. “Most of our new clients … are not sold by mindfulness as a novelty. 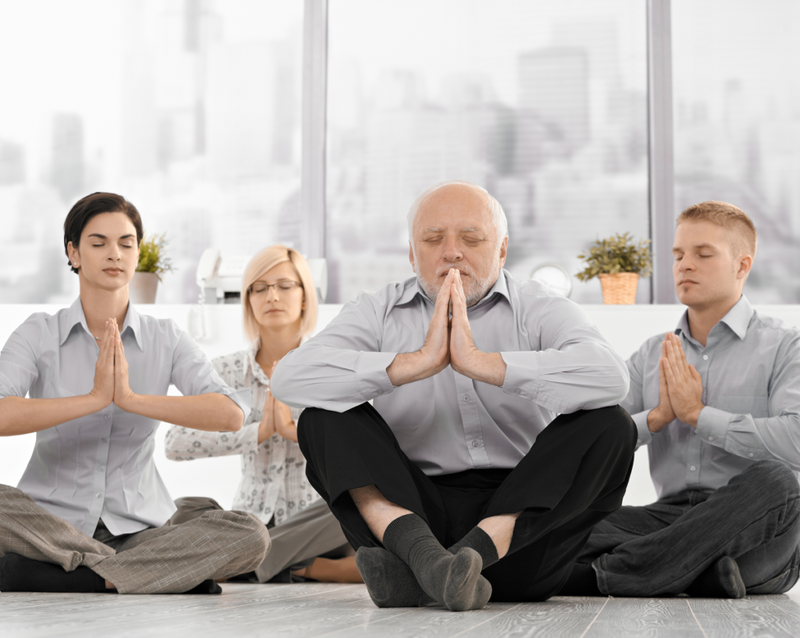 They want to see how these approaches … are truly beneficial to existing priorities like retention, talent advancement, innovation.” For example, one of Berlin’s clients, a Fortune 25 company, has integrated mindfulness techniques into its high potentials program with the goal of creating agile and flexible mindsets as a foundation for leadership. 1) Positive Environments Produce Better Thinking. Just 12 minutes a day of sitting quietly without screen or conversational distraction and following your breathe (with or without music) will reap higher performance, combat aging, and foster resilience and productivity under pressure. Another practice that can generate creative brainstorming or thought: Ask every team member to write down 5 “good news” moments of the week, or on the project. Share them out loud, fast and quick, popcorn style. Just 2 minutes of this literally lifts the positivity in the room and puts people into “possibility” mode. The statistics are there if you need them, but better to just try it and see for yourself. Sometimes the simplest mindfulness practice is to just take a walk outside for 5 minutes. You can do these without cost by any company, any time. What does mindfulness have to do with creativity? It reduces reactivity and promotes a state of calm. We become more receptive to ideas and engage with our surroundings in a more focused way. The receptivity and calm states that result from the removal of internal and external distractions, are ideal for brainstorming new possibilities or opening up people to solutions they would not have considered otherwise. The key to reaping this benefit lies in establishing the consistency of a daily practice, which is why forward-thinking companies such as Google, Aetna, General Mills, Boeing, and many more. The good news from current brain research, as evidenced by MRI scans, is that it takes as little as five minutes a day to build new neural linkages that can lead to profound and lasting benefits emotionally, educationally and creatively. A mindfulness practice can be as diverse as doing yoga or petting an animal or walking in the woods. Over time, the benefits of being able to regulate your mind, carries into better relationships. When you have a disagreement or conflict with a colleague or friend, train yourself to take a few deep breaths while you listen. This helps to clear your mind and reduce your fight-or-flight response. If you are still triggered, practice one of my favorite mindful practices: “I hear you, I get it. This is a challenge. I want to offer a thoughtful response. Can I circle back to you after ____________ (15 minutes? 2 hours? Tomorrow by 9?) When I have more time to give it my full attention?” Then, keep your agreement! One simple mindfulness practice I do when I’m bothered about a person, is identify “the two sins” – one word for what they do that most bothers me. I hold the person’s face in my mind while asking those “Sins” to be released, and blessings (or light or patience or whatever you need) on my ability to be resourceful. It might not change their behavior short-term but it’s a very effective reframe. The worst behavior or situation can make one person laugh, where another person is totally triggered. Agitation is signaling us to visit our own unresolved or sensitive places, and tend to them first. Mindfulness combats stress, the leading cause of heart disease and illness (above any of the usual culprits of diet and exercise, although those are important too). Take a break where you can be truly alone (even if it’s in a bathroom stall or your car) and practice Breath Count: Breath in (through your nose), and count to 5. Hold for 1 Breath out, and count to 5. Hold for 1 second. Repeat 3-5 times until you feel your mind release and your body relax. Aetna recently conducted a clinical study on mindfulness and stress. Participants in the mind-body stress reduction treatment groups (mindfulness and Viniyoga) showed significant improvements in perceived stress with 36 and 33 percent decreases in stress levels respectively, as compared to an 18 percent reduction for the control group as measured with the Perceived Stress Scale. They also saw significant improvements in heart rate measurements, suggesting that their bodies were better able to manage stress. Importantly, among all individuals who were screened for the study, those reporting the highest stress level (top quintile) had nearly $2,000 higher medical costs for the preceding year than those reporting the lowest stress levels. This is the best argument for the CFO on building a culture of mindfulness … hard to argue with the monetary element! You can gain a lot of cultural traction from a small effort, by introducing a culture of mindfulness through small practices – short and sweet. Wherever there is an open minded leader with the willingness to make the environment better, be it so. Mindfulness training is a core element of our Culture Champion and Culture Building workshops for leading people-centered change and organizational agility. Inquire for details.